As you know I am very into health and wellness, and I have a toolkit of sorts to keep my body, mind, and skin healthy! 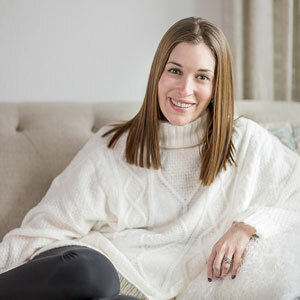 Today I am sharing what I think are essentials for a wellness toolkit! I think a good yoga mat is really key. Even if you aren’t doing yoga, but doing workouts at home, you want to have something good and quality. I have a Jade harmony yoga mat and I highly recommend it. I use it for yoga and ab workouts. I try to do yoga 3-4 times a week at home and once a week in a studio. When I do it at home I do workouts from SarahBeth Yoga on YouTube. I use two different rollers a Jade Roller and an Ice Roller. I use the ice roller a lot more and it’s great to use in the morning for puffy eyes and face and also after a workout! As far as vitamins and supplements I still take a prenatal vitamin and honestly have for about 5 years! I take Omega 3’s because I do not eat seafood. I also take Vitamin D because I am vitamin D deficient. I think it’s good to find out what vitamins you may be lacking and try to find supplements to your daily vitamins. Another “supplement” I use is collagen. I have been using collagen for almost 2 years and I put it in my coffee everyday. You can’t taste it but it’s great for your bones, hair, nails, etc. I’ve been trying to drink as much water as I can and when I notice I am drinking less I use my fruit infuser bottle. My favorites are lemon, and cucumber/pineapple. I don’t know if these two things for sure help me sleep at night but I will say I have noticed a huge change. I take magnesium supplements before bed and I use the this works deep sleep spray on my pillow. I use their other deep sleep products sometimes at night as well. My sleep has been improving a TON! I also try to meditate daily which I have spoken about a million times on the blog. I use the headspace app and I really suggest checking it out. There are TONS of great meditation apps out there too! These are my essentials for a wellness toolkit of sorts. Basically just things to have on hand and use to increase the wellness in your life! I think I need to give the deep sleep spray a try! I’m always having trouble sleeping. Hopefully it can help me copy better. 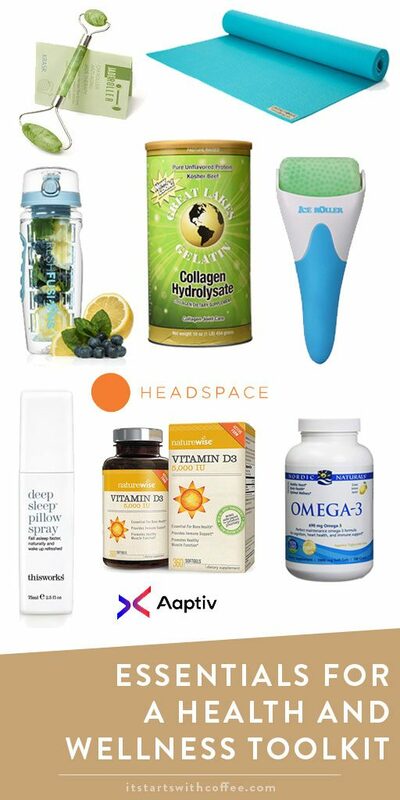 Great ideas for a wellness toolkit because I always have to have my vitamins with me and if I forget them I always will purchase some if I’m on vacation. I really need to get the omega 3s though I hadn’t thought of those. Thank you for sharing this post. I would love to try a fruit infuser water bottle. It’s been on my list of things to try for a while. I absolutely love the idea of a wellness toolkit! Loving the sound of that deep sleep spray – my sleeping schedule is terrible and it’s something I do need to work on. Great ideas! I also take magnesium and noticed a huge difference in my sleep. I may have to add the roller to my wellness toolkit because the puffy eyes have become standard ever since I had kids! Oo really want to try this deep sleep pillow spray, thanks for all these great recs! Having the necessary vitamins to take daily is so important to your overall health and wellness. I would love to try every item in this toolkit. I have got to start taking vitamins! Thanks for these tips! That ice roller sounds amazing! I’m with you on a water bottle, but I find I don’t really like infused water much. might need to try the deep sleep spray! thanks for putting this list together. Great products recommendations! I believe anyone looking out for their health ought to check in with their dr, as many are deficient especially in vitamin D and magnesium. And Omega 3 oils are great for so many health issues. Thanks for sharing these recommendations. I have been meaning to have labs done to see which vitamins I am deficient in. I definitely am not sleeping well. Over the last few months, I’ve been focusing on getting fit. I’ve lost quite a bit of weight. I feel like I need to start taking some vitamins, too. You do way more than I do. I think about doing yoga once a week. I don’t actually do it though. I am supposed to take vitamin D, a multivitamin and another every day. I’ve never heard of an ice roller, it sounds intriguing. I have never heard of deep sleep pillow spray! I need it!